← Opening up, going deeper, and maybe using titles instead of naming names? The pre-Christian Germanic peoples — the Norse, Germanic tribes, Anglo-Saxons, and Goths, to name a few — worshipped mighty Gods and no less mighty Goddesses; revered spirits of the home and of the land; and honored great heroes of the past and their own worthy ancestors. Nearly forgotten for centuries, these ancient, timeless ways are making a resurgence in the modern world. Under several names — Ásatrú, the Elder Troth, Odinism, Theodism, and Heathenry, among others — the old religions of the Germanic peoples live again. 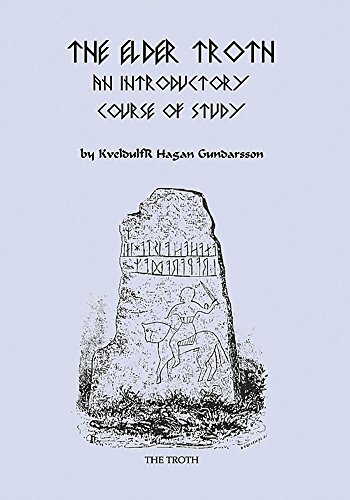 Noted author and scholar Kveldúlf Gundarsson presents a step-by-step course of study for those who have felt the call of the old gods and the old ways. With the readings and exercises in this course — plus copies of the old mythological texts, the Poetic Edda and the Prose Edda — any serious reader can deepen his or her understanding and connection with the old Gods and the old, ever-new ways.